On this page, you will find out the optimal stat priority for your Fury Warrior. We first present the stat priority, before delving into more complex explanations. Our content is updated for World of Warcraft — Battle for Azeroth (BfA) 8.1.5. When not using Cold Steel, Hot Blood, the value of Critical Strike falls to just ahead of Versatility. Strength is your primary stat, found on plate armor, weapons and trinkets. It provides Attack Power, which contributes to the damage of all abilities and auto-attacks. Haste compresses the rotation, reducing the global cooldown, the time between the auto-attack swings, and the cooldown of the rotational abilities Bloodthirst, Raging Blow, and Execute, as well as the speed at which Bladestorm and Rampage deal damage. 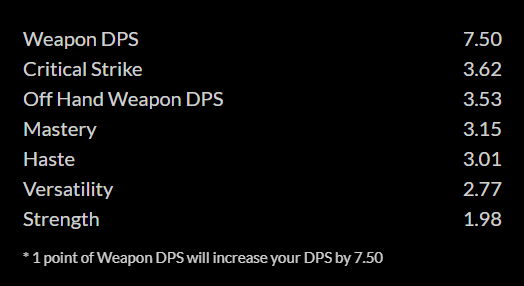 Mastery increases the damage bonus provided by Mastery: Unshackled Fury boosting all damage dealt while Enrage is active. Critical Strikes deal double damage, although Fury does not generate extra Rage on Critical Strike, the way Arms does. The Azerite Trait Cold Steel, Hot Blood increases the value of Critical Strike considerably, putting it roughly on par with Haste and Mastery. Fury is primarily a Haste driven specialization, enhancing the amount it gains natively through Enrage alone. Although it can have a large number of breakpoints, it remains one of Fury's most important secondary stats since more Haste increases the pace of the rotation, equating to more Rage, damage, and Enrage uptime. Racial bonuses have, as a whole, very minimal impact for Fury; anything within 1% of one another is typically considered trivial, and a small enough margin that our recommendation is to simply play what you enjoy the most. 10 Dec. 2018: Updated for Patch 8.1, minor note regarding Critical Strike and Azerite interactions.